At NSBENDO, our mission is to alleviate dental pain and save teeth that would otherwise be lost. Every day we see patients whose lives have been interrupted by dental pain and infection. We are here to relieve that pain and get patients back to their routine. Dental pain can vary from mild to severe and can develop suddenly. This pain is often very difficult to ignore, and can be distracting, annoying and debilitating in some cases. If you are experiencing a toothache, contact your dentist or endodontist and schedule a consultation. Although medications can relieve or minimize pain for a short time, the source of the pain will not be treated, and the pain will return. Endodontists are specifically trained in the diagnosis of facial and dental pain. We use the latest advancements in dental technology to quickly identify the cause of the problem and recommend proper treatment. Eliminating pain while saving a patient’s natural tooth is a significant service that we are uniquely positioned to provide. These symptoms can vary between quick or lingering, intermittent or constant. Tooth Decay – Tooth decay (caries) is another word for a “Cavity”. This is caused when the outer surface of your tooth has been eaten away by plaque. The plaque attaches itself to the tooth enamel and produces an acid that dissolves away the tooth structure. This can eventually spread inward towards the pulp and if left untreated can cause severe pain, sensitivity to temperature and eventually necrosis of the nerve. If you suspect you have a cavity in your tooth, contact your general dentist first, and they will determine if you will require a filling or Root Canal Treatment. Inflammation of the Pulp –This condition is commonly referred to as a “pulpitis”. This occurs when the pulp tissue becomes irritated or inflamed. Symptoms of a pulpitis can include sensitivity to temperature or biting, dull ache in the jaw, pain which interrupts your sleeps or referred pain in the head, temple or ear. The treatment of a pulpitis is Root Canal Treatment. Cracks and Fractures – Cracks and fractures can appear in teeth from general wear and tear or by biting down on a hard object. In some cases, the crack will be evident immediately and you may even be able to feel it with your tongue. In others, however, it may only manifest itself as a dull pain when biting or sensitivity to temperature changes. Many people report a sharp pain if they bite down on something a certain way. If you are experiencing any of these symptoms, it is best to schedule an appointment with you dentist or our office for and evaluation of the tooth. Depending on the severity of the crack, the tooth may require a crown, Root Canal Treatment, or if the fracture is too severe, the tooth may need an extraction. Click here for more information on cracked teeth. Dental Abscess – A dental abscess is typically caused by a buildup of bacteria inside the pulp area of the tooth. This tends to cause pain to biting and inflammation or swelling in the surrounding tissues. Other symptoms may include persistent bad-breath, extreme sensitivity to temperature changes or a localized bump/bubble on the gums near the tooth, also known as a sinus tract. At this point the pain is usually severe and will require urgent attention. Over-the-counter medications such as Advil or Tylenol can help reduce the symptoms until your appointment. The recommended treatment for an abscess is Root Canal Treatment. No matter what the cause of dental symptoms, it is extremely important to see your dentist or endodontist immediately. The sooner the symptoms are diagnosed and treated, the better the outcome of the case. How can I prevent dental pain? The most important factor in preventing dental pain is to practice a healthy dental routine, such as brushing and flossing. The second most important factor is visiting your dentist yearly for dental cleanings, evaluations, and oral cancer screenings. Dentists are trained to diagnose dental issues early to prevent the issue from becoming worse and causing sudden dental pain. Another important factor is being aware of dental symptoms, tracking the source and progression of symptoms, and advising your dentist when symptoms persist. Dental symptoms are hard to ignore, but being proactive regarding these symptoms takes a bit more effort. Contact your dentist’s office to discuss the symptoms and they will schedule an appointment to diagnose those symptoms. Lastly, it is important to protect teeth from injury by using recommended dental fixtures. Mouthguards: Used to protect an athlete’s smile from serious injury caused during contact sports such as football, hockey and lacrosse. They can help prevent injury to teeth, lips, cheeks and tongue. Although there are a few types of mouth guards available, it is important to consult with your dentist to determine which one is best for you. Nightguards: Used to protect your teeth from strong vertical forces caused by grinding and clenching while asleep. These strong vertical forces can cause teeth to crack, break and slowly wear teeth away. Although there are a few types of mouth guards available, it is important to consult with your dentist to determine which one is best for you. Your dentist may also want to evaluate the root cause of the issue, and recommend treatment based on the results. Although there are ways to prevent dental pain, dental pain can arise suddenly due to unforeseen injury or trauma to teeth, such as cracks and traumatic dental injuries. At NSBENDO, we take the time to thoroughly assess the risk factors in every case. 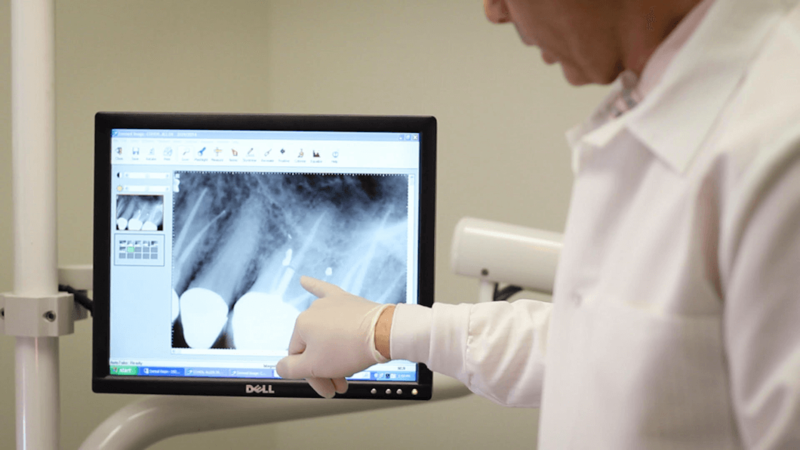 When needed, we use 3D imaging CBCT scans and clinical microscopic examinations to evaluate the case. Although most teeth can be saved with endodontic treatment, occasionally the tooth cannot be saved. Our endodontists will collaborate with your dentist to recommend the best possible treatment for your specific case.